I surprised Victor for his birthday with a 5 night stay in the most colorful town by the sea, Cartagena. A few different friends mentioned we’d love this area of Colombia and they were absolutely right. Traveling there was quick and cheap considering we were already in close proximity after working in Miami during Art Basel 2018. We flew into the Rafael Núñez International Airport and took a 15 minute taxi ride along the Caribbean Sea to our hotel. Our time there was spent roaming cobblestone streets soaking up the bright culture and eating great food. 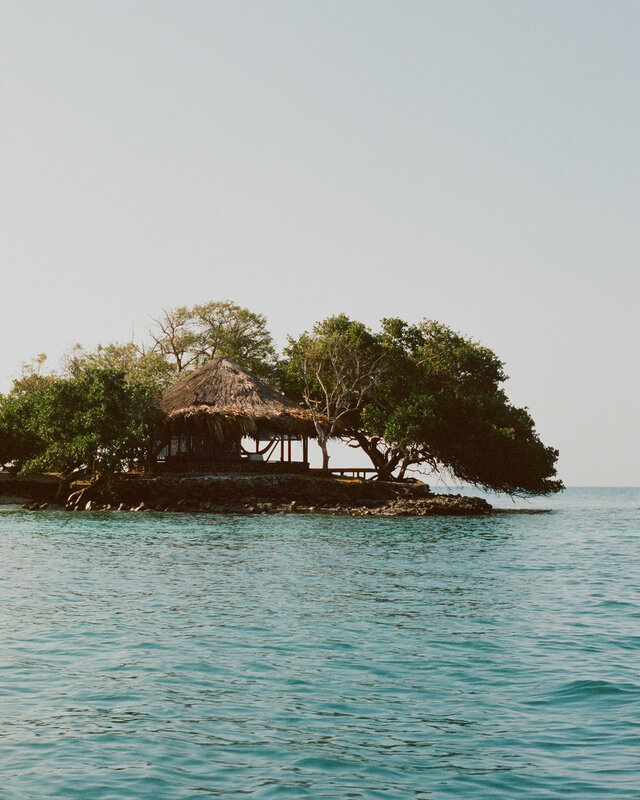 We took one day to adventure out of the Old Town visiting the Rosario Islands. Our hotel was tucked away in a quiet part of town about a 5 minute walk to the center of the city. Other than the islands, we walked everywhere. Cartagena, Colombia is a beautiful port city located on the tip of South America. It’s nickname is the ‘Walled City’ because of a massive literal wall protecting the entire center of the city from the ocean due to several invasions due to its prosperity. The city rapidly grew and now has two different sides of Cartagena. There’s the Old Town of what you usually see photos of and then there is the newer section of sky scrappers 10 minutes southwest. OH LA LA Fresh bread, natural juice and jam, great coffee, amazing breakfast all in a beautiful setting with high ceilings and air conditioning. Everything was carefully thought out and that made a wonderful dining experience. We were leaving as a private cooking class was coming in and wish we had time to take a class here! LA COCINA DE PEPINA Traditional Colombian cuisine. One of our favorite meals. BOHEMIA Romantic setting, great food in a courtyard. Nicer, higher priced than cozy local spots. LA CECIHERIA Anthony Bourdain filmed here and for a good reason. We got the peanut octopus and Colombian ceviche with two Aguilas then walked across the street to cool off at the Sofitel. LA VITROLA Classic. Nicer restaurant, traditional Colombian cuisine, large portions. DI SILVIO TRATTORIA Pretty good Italian pasta! Not the best we’ve ever had, but a very good break from ceviche. There are two locations across the street from each other. DEMENTE Hipstery bar, decent food. The honey gnocchi was very enjoyable. D’LI PALETERIA Located in Holy Trinity Square, right by Demente, where the town gathers every night for music, dancing and food. We got paletas from here 3x and enjoyed the gelato ones best. Amazing place for people watching at night. BEIYU Great cafe serving healthy food options including real as it gets açaí bowls! Very good coffee here. ISLAS DE ROSARIO To explore more of Cartagena outside of town, we booked an inexpensive all day tour that included: shuttle, fresh caught lunch and boat rides to three different islands. Most hotels work with travel agencies so you don’t get ripped off. For us, this was more of an adventure than being lazy on the beach. These islands are filled with culture if you look around. Just a heads up, peddlers do not mess around on the islands, even more so than in the main Old Town. People will try to sell things to you immediately after you set your bags down. Tourism is the main source of their income, so be respectful while visiting their land. CASTILLO DE SAN FELIPE DE BARAJAS We walked here from the Old Town. There is a small entrance fee that allows access to a castle built in the 1600’s overlooking the entire city and ocean. We recommend going for sunset. OLD TOWN You could get lost wandering around the city all day. 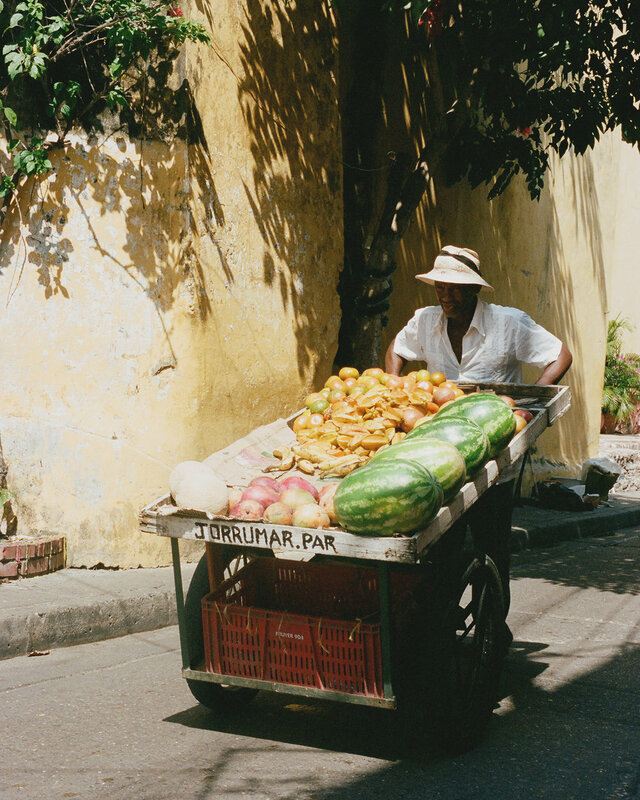 The Old Town is the center of Cartagena where you’ll find all the colorful buildings, fruit stands and shops. The items we saw being sold mosty unique to Cartagena were mochila bags and hats. CASA PIZARRO Located a 5 minute walk to the center of the city, tucked away in a more quiet part of town. The hotel was about $80/night USD for king suite that included a private jacuzzi in a courtyard connected to our room. A fresh breakfast was also included on their rooftop overlooking the city. The hotel also helped us with ordering taxis and planning our Rosario Islands trip.